The R-Squared Method: I'm In Discovery Channel Magazine! Insights from the intersection of business and technology. I'm In Discovery Channel Magazine! 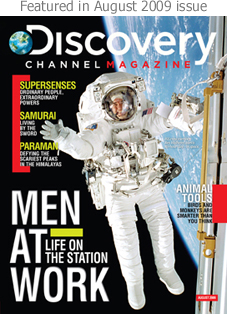 I am happy to announce that I have been featured in an article in Discovery Channel Magazine! Released throughout Asia, the August 2009 edition of the magazine includes the article "Supersenses" where I finally reveal to the world my super power. For those who don't know, I have pretty phenomenal hearing. As a child I remember taking a hearing test and having the school nurse call me "a freak with dog ears." As you might imagine, that made me decide to keep it to myself. To find out some concrete numbers, Discovery Channel agreed to pay for a hearing test. As it turns out, I am in the top 95% of the world! Read more in Discovery Channel Magazine! P.S. If anyone can find a link to the actual story, please post it in the comments below, or send me an email and I will update this post. Thanks! While people may have different views still good things should always be appreciated. Yours is a nice blog. Liked it!!! Thanks Mark. I appreciate it! Copyright 2010, by R-Squared Computing, Inc. Simple theme. Theme images by gaffera. Powered by Blogger.